Essentialism in Education is a movement started by William C. Bagley. The reason for the movement was to emphasize the teacher’s authority in the classroom. The advocates of this movement condemn all styles of teaching that are not in line with essentialism. Supporters’ of essentialism are of the view that the standards in the schools have been lowered by the greater educational opportunities and they also feel that the subject matter should be the center of the curriculum. Progressives, who stress on providing education based on the interests of the child through hands-on activity, are also criticized by the essentialists. The points included in the tenets of the essentialists’ state that education is a fine combination of hard work and effort. If the student is interested in the subject he/she is studying that’s good, but if not, the interest of the student must be developed in that subject area, as the student doesn’t what he/she may be needing in the future and student must perform all the tasks regardless of the fact, whether the teacher is providing him/her with sound motivation or no. A teacher’s hold and order in the class is of the essence, no education or learning can take place in a noisy environment. Students should be directed and helped by their parents and adults regarding their future, as students cannot think of what’s best for their future, and should be helped in order to overcome their desires, and what should be their objective in their future. A vital part of the classroom is the teacher. The whole classroom’s educational environment is centered on the teacher, so it is the teacher who is responsible for the student’s mental and intellectual growth as well as directing their future’s in the right direction. The Movement of Essentialism begin as a counter act to the student center educational institutes in 1930’s and 1940’s in America. The essentialists were of the view that due to the student centered education environment, students were getting the education that they require for their future. According to the essentialists, the reason for schooling is to educate the students in such a way that they can make a beneficent contribution to the society. And teach them what is necessary to live well through modern day life. According to essentialists, the study material of the students of the elementary schools must concentrate upon the basic skills, and as for the secondary school, the curriculum shall concentrate upon that particular discipline that student is going for. The term essentialism is generally used in three meanings. Firstly, it uses biological, physiological and, increasingly, genetic causes to explain the unchangeable human behavior. Secondly, term essentialism is used when generalized statements are asserted that make no reference to cross-cultural differences or previous historical variation. Sometimes it is also known as universalism. The third and final use of the term refers to all the everyday conversations or academic writings in which we make use of the unified concepts. Essentialism in Education is a fast rising trend that looks to benefit education in the future. What is the major essentialism contribution to the education? Is Humanism And Essentialism Alike? 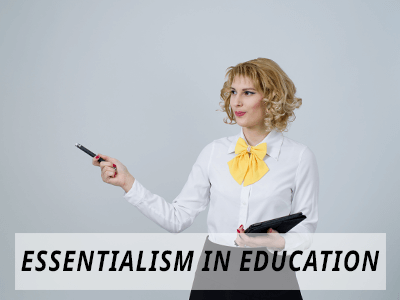 What is essentialism in education? Q:Which disciplines offer contributions of Essentialism on Education? A:The Essentialism in Education focus on numerous disciplines of learning and education. These include Reading, Art, Literature, Writing, Foreign Languages, Mathematics, History, Science, and also Music. Q:What is Essentialism in Education's strongest criticism? A:One of the greatest criticism of Essentialism in Education is the fact that this idea stresses solely on teaching the traditional basic subjects to the maximum level, meaning there is less capacity to teach more contemporary and creative education and "manufacturing" students that do not think by themselves. Q:What is the contribution of essentialism to primary education? A:Contribution of essentialism to primary education has been greatly considered. It pinpoints the key importance of early childhood learning and how it is positively affected by essentialism. Essentialism states that a sound body of basic knowledge has to be attained before further learning can take place. Young students who develop a strong educational foundation can learn better at higher levels of school and college. Q:What are the views of parents about child centered education? A:Most of the parents in the United States are in favor of the essentialism in education since they themselves were taught the traditional way of learning things. However, with the increase in ethnic mix in the country, we can see a much more wider approach being taken to compete with the orthodox methods. Q:What is the major essentialism contribution to the education? A:Essentialism is a concept that focuses on primary and basic teaching. Essentialism provides students with strong basic education such as reading writing, listening, speaking, drawing, etc. it has largely contributed to the education field, enabling students to develop a sound foundation of basic knowledge. Apart from just academic knowledge, essentialism also instills moral values and ethics in students, proving them with the sense to become educated good human beings. Q:What are state specific essentialist school grants or teaching grants? A:State specific grants for teaching and essentialist in education are types of financial aid that is offered by a number of public and private institutions. Students wishing attain higher education in this field but have little means to do so can apply for state grants. State grants vary from state to state and each have a unique feature which makes it different from other states. These grants are disbursed to students coming from low income areas and have a desire to become teaching professionals. Q:As I read about educational essentialism and technology, I came across the Early Childhood Literacy course. Can you please tell me what are the highlighting points of this course? A:The Early Childhood Literacy course is part of many educational courses of elementary level in the United States and has about 3 credits. It gives an intro as to how to make children read as well as write in their preschool phase. Progression of communication, literacy, language and listening are covered in the course. It also uses the literature of children to help facilitate literacy development in the early childhood. Q:As I read about the educational essentialism history, I got to know about the importance of sociology. Can you please tell me in what form is this subject taught at schools? A:Educational Essentialism History is filled with references to sociology. Most of the undergraduate degrees in education have the 3 credits worth course on Essentials of Sociology. This course stresses on areas of study such as the various terminologies, questions, queries and theories that are used by the sociologists. These theories are used in studying how the groups, institutions, cultures, values and norms are involved in shaping up societies and the global views. Q:What can you tell me of courses of essentialism education in business, such as E-Business? A:E-Business is a contemporary joint of business studies. As the course name suggests, E-Business relates to the business strategies with the help of Information Technology. The course stresses on gaining competitive advantage over the virtual marketplace. Some of the topics included in this course are networking, foundations of business over the internet, security and ethics of online business etc. Q:Can you briefly tell me about Essentialism in Education and family role in it? A:Essentialism in Education emphasis on the fact that children cannot think of what is good for their future, so the teacher and parents should plan out a proper future for them and guide them accordingly with a proper discipline and system. Family plays a vital role, because according to basic principles of Essentialism in Education, parent's guidance is the most essential part. Q:What is the importance of a teacher’s role in essentialism in education? A:Teachers play a major role in essentialism in education. They need to be patient, have a positive attitude and need to effectively communicate with the student in order to assist in development of a students mind and body. This phenomenon has become widely popular in the as it not only focuses on academic growth but also helps student to become better human beings. Q:As I read about the sense of Essentialism in Education, there was mention of the course on World Geography. What are the contents of this course? A:It is common to see the mention of course on World Geography while going through the article on sense of Essentialism in Education. This is a 4 credits worth course and is designed to make the students understand the attributes of human as well as physical terms, which offer diversity and uniqueness to the patterns of different regions of the world. Q:As I read on what is the contribution of Essentialism to Education, there was mention of the course on Personal Finance. Can you please tell me more about this course? A:Whenever students read on what is the contribution of Essentialism to Education they get to read about the course on Personal Finance. Personal Finance is a 3 credits worth course and stresses on the application of algebraic concepts to the various business problems that are used in development and improving of technical, critical and quantitative thinking. analysis of business issues is also studied. Q:Reading about should schools use educational essentialism mentioned ‘cultural lag’. How is this related? A:Cultural lag would be mentioned when reading if schools should use educational essentialism. It is one of the issues raised by critics of this subject. Critics believe that by stressing on the importance of traditional subjects, it would create a vacuum where the new generation will not be able to keep up with the constantly changing world. This delay would not only be harmful but also create a prominent difference between generations. Q:Reading about a story with using essentialism in education mentioned E.D Hirsch. What is the significance of this person? A:E.D Hirsch would be mentioned when reading about a story with essentialism in education. E.D Hirsch is an American educator and a literary critic who with William Bagley is a strong supporter of essentialism in education. Hirsch has authored several books in support of essentialism and has also been a vocal supporter for the cause. He used quotations and examples in his most popular book Cultural Literacy to support his argument on essentialism. Q:What is the history of Essentialism in Education? A:Back in 1940's, when the student centered educational institutes were introduced in America, the people who did not agree to the idea started an anti-student centered education movement led by William C. Bagley called Essentialism in Education. According to this theory, a student cannot decide the best of his/her future thus requires the constant guidance of teachers and parents. Q:Reading about criticism of educational essentialism mentioned the Great Man Theory. What is the premise of this theory? A:Great Man Theory would be mentioned when searching for criticism of educational essentialism. This theory deals with the concept popularized by Thomas Carlyle, who explained that history can be understood because of the actions and decisions of great men. This theory has been countered by other prolific writers, however it remain closely associated with the concept of essentialism in education. Q:Reading about essentialism and education, I also came across neoessentialism. What is the premise of this school of thought? A:Neoessentialism would be mentioned when reading about essentialism and education. This is a recent branch that is considered to be a counter culture movement. This school of thought is in response the original movement 1930's and its criticism. Neoessentialism has called for the addition of computer science in order to adapt to the latest changes. Both of these movements are extremely important for the advancement of education in the United States. Q:Is Humanism And Essentialism Alike? A:No, humanism and essentialism are not alike. Essentialism deals with the study of attributes that make up ones personality and membership in the society. On the other hand humanism is a study approach that has a more general view and includes social science. So the major difference between the both is that essentialism focuses on a n individual whereas humanism focuses on the whole humanity. Q:My search for what is the proponents of essentialism mentioned the constructivist theory. What is it all about? A:The constructivist theory would be mentioned when searching for what are the proponents of essentialism. This theory discusses the possibility of human learning from their experiences, interactions and ideas. This theory has formed the basis of education reforms and teaching methods in the past and present. Constructivism is integral part of the general topic of learning theory. .
Q:Reading on how to explain educational proponents of essentialism mentioned William Bagely. What is the significance of this person? A:William Bagely would be mentioned when searching on how to explain educational proponents of essentialism. William Bagley played an important part in the history of essentialism and was one of its most notable admirers. He is responsible for publishing the Essentialist's platform in which he discussed three important points on essentialism in education. Q:What is essentialism in education? A:William C. Bagley came up with the concept of Essentialism in Education. This mode of teaching emphasizes on the teacher being the ultimate authority in the classroom. Supporters of this ideology criticize all other more liberal modes of teaching if they are not in line with basics of essentialism. Supporters' of essentialism are convinced that the depreciation of educational standards is due to the fact that the teacher and the subject matter are no longer the focus of the curriculum. Q:While I was reading about essentialism in education philosophy, I came across the principles of essentialism. Can you explain this? A:Essentialism is a education philosophy in which knowledge of the society and civilization is taught to student through classroom curriculum's. This involves the study of the current natural environment, natural laws, character development, patriotism, and academic knowledge. The core aim of essentialism is to promote a more common American culture. Q:Educational essentialism is beneficial in what ways? A:Essentialism is referred to an educational philosophy that reflects standardized classroom studies. Some of the major benefits of educational essentialism are that students are provided with strong academic foundations, hard work is encouraged, discipline is maintained, and basic skills are focused upon. However, this philosophy is highly debated across many states. A:William C. Bagley Was the founder of this movement. The essence of essentialism of education is that the teacher is the authority. Supporters of this ideology are known to discourage all other forms of teaching; the further an idea is from this concept the more it will be frowned upon. Supporters' of essentialism believe that quality of education is falling and schools are failing in bringing out the best in students mainly because the position of teachers as the main authority figure has been challenged and the subject matter is no longer the center of the curriculum. Q:Is essentialism philosophy of education included in the course structure of master of science in education? A:Essentialism philosophy of education is a basic pillar of any education system and practiced all over the world despite whatever is said against or in favor of it. Therefore yes its ideology and history is taught not just in the master of science in education course, but any course focused on exploring the field of education in depth and in general. Q:Could you give me some background on educational essentialism? A:Educational Essentialism was initiated in 1930's and 40's in America. The basic idea of this movement is that in terms of education, students should be educated in a way that it prepares them for the future and they could contribute in society as a healthy and beneficial element. It revolves around teaching student skills which help them live a healthy and positive life in the modern society. Q:How does education essentialism focus on character building? A:Education essentialism not only focuses on traditional subjects but aims to develop character by instilling in them respect for authority. Emphasis is laid on ethics, values, morals and discipline, things that are not learnt by books. With focus on personality and character traits the individuals get academic education in a more constructive manner. Q:In today's time how is essentialist education viewed? A:Modern times have changed, changing the needs and the education requirements. Many new progressive subjects have been introduced in the curriculum. On the other hand, essentialist education aims to focus on the basic subjects only with an emphasis on character building. The importance of focusing on personality development cannot be denied in any age or time even if some may criticize is as a conservative approach. Q:What are the features of essentialist classroom? A:The different features of essentialist classroom stress the role of the teacher as the primary focus. A teacher is considered the most important source for transferring knowledge. They are responsible for instilling respect for authority and for guiding the students towards a better future. The features also emphasize on the significance of curriculum which means that all subjects must be studied by the students regardless of the interest factor as they might prove beneficial in future. Q:Why was essentialism in education started? A:The essentialism movement was initiated to emphasize the role of teachers in the classroom. It promoted a style of teaching that focused upon teachers' authority. Supporters of the movement have the view that the education standards had been lowered due to an increase in academic opportunities. Essentialism also stated that subject matter should be the centre of the curriculum in education.